Pancakes aren’t exactly what most people envision as a nutritious meal, but these blueberry teff pancakes pack a powerful nutritional punch – the perfect breakfast or brunch for refueling and enjoying a good meal after your weekend run. Teff may be the next quinoa – an ancient grain adopted by modern culture as a trendy superfood – except it tastes better. I do enjoy quinoa, but I found teff flour to be rich, nutty, and flavorful. Ryan, who thinks quinoa tastes like dirt, raves about the flavor of these blueberry teff pancakes. Teff is a naturally gluten-free grain, although these pancakes are not gluten-free because I used some whole wheat flour to achieve a fluffy texture (gluten plays a role in leavening). The grain is popular in North African cuisines, particularly Ethiopian and Kenyan cuisine. Yes, teff is a dietary staple for some of the world’s fastest runners. Teff won’t transform you into a superhuman runner, but this grain does provide a superb nutritional profile. 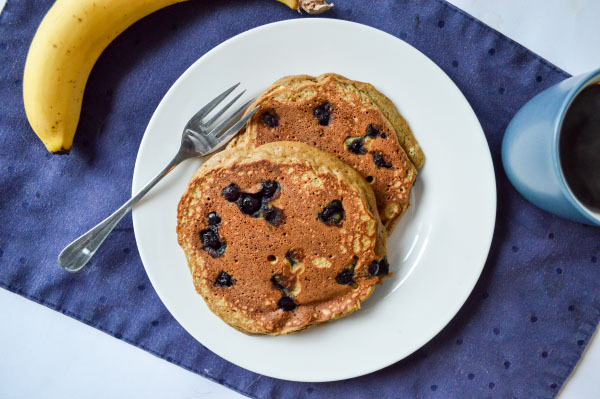 A ¼-cup serving of teff flour – the amount per serving in this pancake recipe – provides 15% of your daily iron, 5 grams of fiber, and 5 grams of protein. Teff contains more calcium and vitamin C than other whole grains. Teff’s iron is what makes it most desirable to runners, especially female runners. Female runners lose iron through both menstruation and foot-strike hemolysis but overall we consume less iron than men. Iron deficiency can lead to anemia, fatigue, a decrease in athletic performance, and other issues. If you don’t eat red meat, you need plant-based sources of iron such as teff. Even if you do eat red meat a few times per week, teff is still an excellent pick for a heart-healthy source of iron. A few recipes in Run Fast, Eat Slow featured teff as the main ingredient, which served for the inspiration of this recipe. Pancakes are one of my favorite weekend breakfast and I constantly experiment with the recipe to strike the balance of nutrition and flavor in a post-run meal. 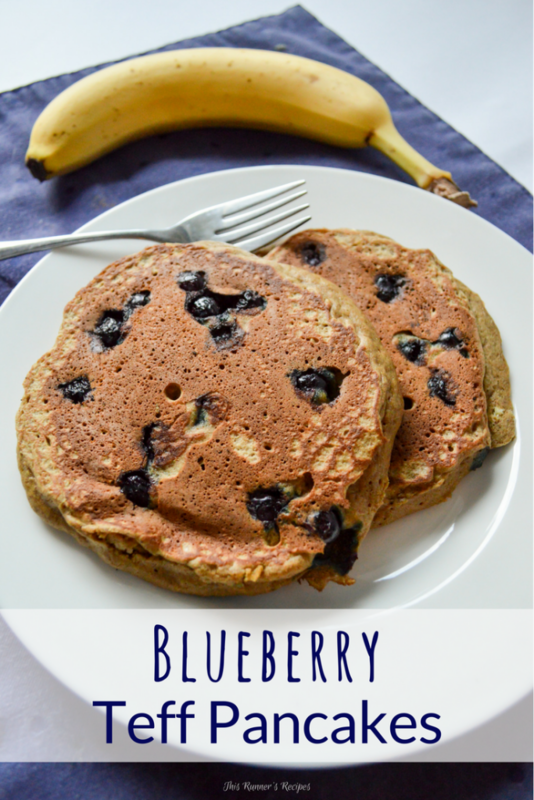 So far, this blueberry teff pancake recipe is my favorite. In addition to all the nutrients which the teff provides, the blueberries supply a wide array of nutrients and flavor. Blueberries are full of antioxidants that reduce oxidative stress and inflammation – meaning that these sweet berries can help you recover better after a hard run. 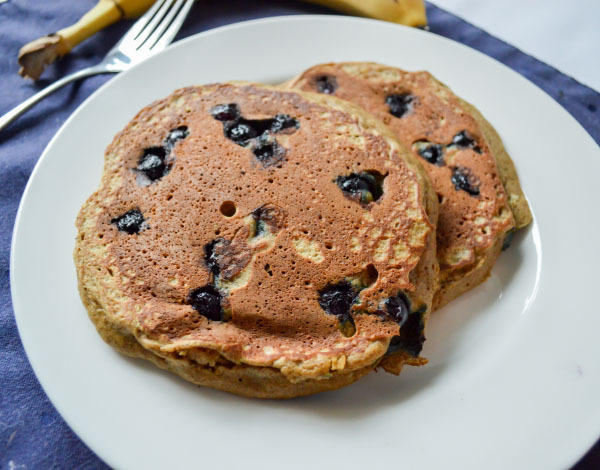 Beyond nutrition, these blueberry teff pancakes taste good. They boast a sweet, nutty flavor and a fluffy, melt-in-your-mouth texture. Teff adds more depth of flavor than whole wheat flour. The vibrant sweetness of the blueberries strikes a balance with the earthy flavor of the teff. And you’ll want to top these pancakes with pure maple syrup, which further complements the flavor of the teff. Most of all, these pancakes are satiating. With the fiber and protein of the teff flour, these will fill you up for hours – at least they did for both Ryan and me in the taste test. 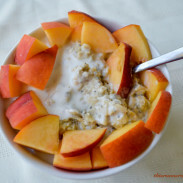 Add a bit of peanut butter or Greek yogurt, top with some maple syrup and more blueberries, and you have a breakfast with satisfies even the rungriest of appetites. Whisk together the egg, coconut oil, and maple syrup in a mixing bowl. Add the milk and stir to combine. Carefully measure the flours (do not pack - measure by weight or spoon into the measuring cups). Add the flours, baking soda, baking powder, salt, and cinnamon and gently stir to combine. You do not want to over mix, as this will result in flat pancakes. 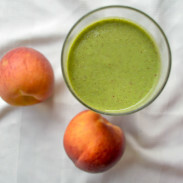 If needed, add a tablespoon or two of water to reach the desired consistency. The pancake should be smooth and easy to scoop. Heat a flat skillet or pan over medium low heat on the stovetop. Lightly grease with coconut oil or butter. Once the pan is hot (drops of water should sizzle on it), pour approximately 1/3 cup onto the skillet. Most pans will cook two pancakes at a time - don't crowd the pan. 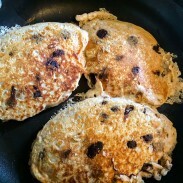 Sprinkle a handful of blueberries on top of each pancake as soon as you pour the batter. When the edges are firm and bubble form on the top, flip and cook for another 1-2 minutes, or until the pancake is golden brown on both sides. Remove from heat. You can keep pancakes warm while cooking the remaining batter by placing them on an baking sheet or ovenproof plate in a 175 degree oven. This recipe makes 5-6 pancakes, enough to serve 2-3 people. You can easily double the recipe to serve more. What’s your favorite type of pancakes? Have you tried baking with teff flour? Ive never tried teff flour- it sounds great! These pancakes look delicious. Thank you! You should try it – it’s really versatile in all sorts of baked goods. Whoa, the stats in teff flour are IMPRESSIVE! I want to go find some now and try this out! I hope it’s not hard to find up here! I used Bob’s Red Mill brand – which I’ve seen both in the grocery store and online (we got ours from Thrive). I love blueberry pancakes! it’s my standard order at the diner when I want pancakes (blueberry whole wheat pancakes with walnuts). I’ve never heard of teff flour but I am going to look for it now! You should try teff flour! I want to try muffins or cookies with it soon. I’ve been meaning to try out teff flour! I remember my mom baking with it years ago but I haven’t tried cooking with it myself. Time to give it a whirl! I saw quite a few recipes for Teff flour in the Run Fast. East Slow. cookbook. I have yet to try it but now I think I will pick some up. Why? Because pancakes are my favorite! Pancakes are my favorite too! The pumpkin ones in Run Fast. Eat Slow look so good also. I actually do really like Teff flour and bake with it occasionally — but I had no idea about all the iron stuff (although I’m mostly past menstruating). Thank you! I need to try those double chocolate teff cookies….they look so good!